From sunrise to midnight, Tutuban Center has everything a certified shopper could want. And Tutuban Center announces that everything is business as usual at this exciting shopping mecca in its aim to continue serving the public. All geared up with the newest and never-before-seen attractions, this all-time favorite shopping hub is ready to strengthen its niche. Meticulous shoppers will once again enjoy the best and budget-wise shopping experience at the heart of Manila. 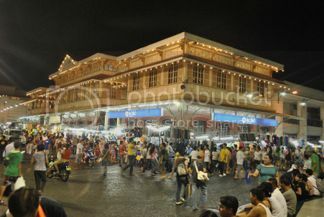 Despite several challenges it faced the past year, Tutuban Center remains totally equipped to accommodate thousands of shoppers who flock the busy streets of historic Divisoria so they can continue to enjoy big bargains and discounts for a wide variety of quality goods and services while providing a clean, secure, organized, and convenient shopping environment. Yet amid the quality yet affordable products available, it’s not just a venue for everyone’s shopping frenzy. Tutuban Center also advocates customers’ health and well-being by building the “Sports Track” facility. This fitness hub branded with versatility is a fitting venue for various sports activities like sports fests, funs runs, and traditional Filipino games. With Sports Track, shoppers, including residents within the area, can surely find an easy yet enjoyable way to shop and get in shape at the same time. Just like shoppers who can’t resist the urge to buy, the delight of food and drinks can be irresistible for weary and hungry shoppers. Tutuban’s “Foodstreet” offers eclectic dining options that can surely satisfy every shopper’s palate. From delicious and popular Pinoy food fare to other mouthwatering Asian delicacies, people can always pick their gastronomic treat after a tiring shopping day. Most of all, these tried and tested delectable dishes are truly budget-friendly. For the weary shopper who wants to be entertained, Tutuban Center has something to capture the hearts and minds of kids—even the kids-at-heart. Last year, the Tutuban Virtual Zoo opened its doors to the public as a unique attraction and continues to entice the crowd through its magnificent 3-D pictures of favorite zoo animals in breathtaking realism. And the best thing about it is admission is free. And by the time darkness envelops the sky and mall shops are closed, it’s the time that the Tutuban Center Night Market opens. This shopping alternative offers a clean, organized and secured area made up of stalls that sell a variety of goods, from personal items, kitchen wares, garden accessories, handicrafts, to sports gear, and novelty objects—all still within anyone’s budget and available even beyond the regular mall shopping hours. Meanwhile, if the body wishes to take a rest after a full day of shopping madness, get the best place for the best value, and it’s just a few steps away. Orion Hotel, located at the 3rd level of Primeblock Building, features well-appointed guest rooms at affordable prices, plus superb conveniences and unmatched access to a world of shopping for discerning shoppers. Guests can avail of a delightful accommodation at Orion Hotel, with set breakfast, at an exciting promo rate that starts at P1,800 net and good for two (2) persons. You may call (+632) 450-3007 to 10 for more information. Continuing its trademark for local wholesale and retail businesses, Tutuban Center never breaks its promise of genuine shopping delight. Don’t miss this most unique commercial and recreational one-stop family destination in the city, a place of progress where you can find everything that you need. Conquer the rush and revive the shopping drive—because Tutuban Center, located along C.M. Recto Avenue in famed Divisoria, always awaits you.